I started in 2004 with ESX 2.0 at a German manufacturing company. The design evolved and we added more and more advanced components with the new versions. We progressed from a test/development phase to full production VMs. When the first VDI product went beta (it was called VMware VDM back then), I liked the idea of having a virtual desktop and from that point in time I was also a fan of EUC. Working for comdivision consulting as an VMware Instructor made me go through all the advanced topics of the VMware SDDC. 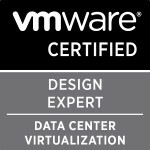 I was an early adopter of the VMware certification program, starting with VCP-2. I kept my certifications current up till now and also did many of the VCAP exams, because I felt like this was the natural next step. In my career and especially as part of the comdivision team, I do not only create designs for new infrastructures, but also review designs from my colleagues. The VCDX journey started last year in Summer, when we attended the one-time 5 day preparation offering at the VMware headquarters in Palo Alto, California. Back then we had a lot of ideas and a few concepts, but no real strategy. We aimed for a February defence, but realistically we moved the defence to June where I passed in the first attempt. I found it very useful to work on a joined design together with my colleague Yves Sandfort. While Yves wrote the parts of the design that dealt with the Cloud environment, I could focus on the desktop side. This way we could also discuss and debate a lot of items that needed to be clarified before we even went into the phase of mock defences and final preparation. During this time I easily spent more time with Yves than with my wife or anyone else. You need to be good friends to go through all the ups and downs of a VCDX design preparation. Start building the defence presentation from the first minute. Building it after the design and before the defence made it cumbersome in some areas. Start early and create a timeline/project plan. Stick with it, no excuse, don’t delay until last minute and do not wait for the dates of next year to show up. You can always start and finish it. I would probably have a better time / project management in order to have a better overview of what is done or missing and I would start building my slide deck earlier. Apart from that I am pretty happy the way it went. Life did not change so much. I still design architectures, but the way I create them has changed. With all the reviews and mock-defences I did, I think I have a better eye for erroneous designs right now. I don’t believe a certification has to be reflected directly in salary – it will pay off in a different way.